The super-bright 4.3” HG1G TFT LCD series of touchscreens offer a high resolution of 480 x 272 pixels, and a vivid 65K color-display with a brightness of 800cd/m2. With most of the features and functionalities found in a larger screen, including remote monitoring and control and an FTP function, HG1G also supports multiple communications – up to four protocols simultaneously – and has a best-in-class LED backlight life of 70,000 hours! This provides many years of operation, as the life is extended by a backlight that can be automatically switched off when the unit is not in use. HG1G touchscreens can also be mounted with the screen orientation set to portrait or landscape mode depending on space requirements. It’s flexible and small enough to fit in a tight space, and priced to fit a tight budget! The HG1G HMI has a wide range of operating temperatures from -20 to 55 degrees C, and is rated IP66F/IP67F and NEMA 4X to allow for installation outdoors, or indoors in wash-down areas. It is also suitable for installation in Class 1, Division 2 hazardous locations and has UL 508 approval. This NEW super-bright HMI supports FTP communication and multiple communication protocols – up to four protocols simultaneously. Built-in web server IoT functionality allows browser-based remote access from any internet-connected device, at any time. 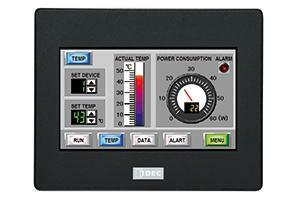 The HG1G HMI is programmed using WindOI-NV4 software, part of the Automation Organizer suite. IDEC WindOI-NV4 software is easy and intuitive using drag-and-drop functionality and a built-in library of images.